Although some people suggested a few years ago that eradication might be too expensive and the goal should be simply to keep the disease at bay, Dr. Thompson told faculty and staff at a seminar Nov. 15 that “we are saving lives and money when we invest in this. “ As an expert in using quantitative analysis to evaluate the benefits, costs and risks of preventive medicine and global health interventions, Dr. Thompson says mathematical models can help shape more effective long-term public health strategies. Before joining the College of Medicine as a professor of preventive medicine and global health, Dr. Thompson served on the faculty in the Departments of Health Policy and Management and Maternal and Child Health at the Harvard School of Public Health and in Adolescent Medicine at Boston Children’s Hospital. She created the Kids Risk Project at Harvard and later established the nonprofit organization Kid Risk Inc.
One of her often-cited studies estimated worldwide savings of about $40 billion to $50 billion since 1988 when national governments and other organizations formed the Global Polio Eradication Initiative (GPEI). By 2035, the initiative is expected to prevent more than 8 million cases of paralytic polio in children. And prevention means billions of dollars saved from reduced treatments costs and gains in productivity, in addition to improving the lives of children who can walk, run, and play without worrying about the crippling disease. 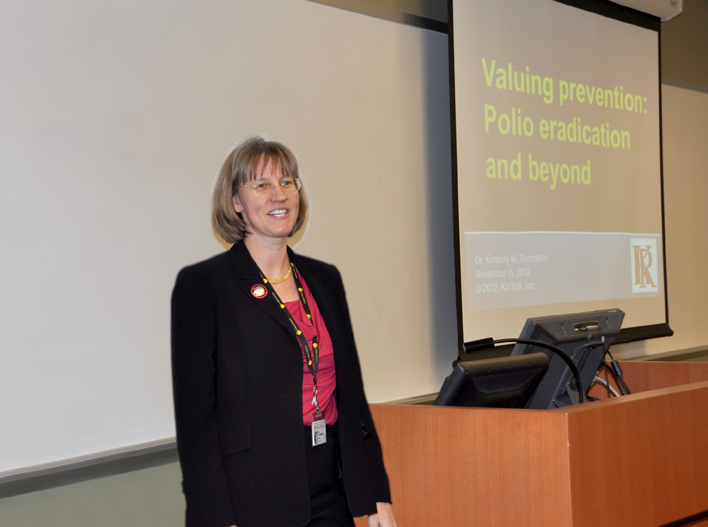 The global effort to eradicate polio offers other benefits, such as delivering vitamin A supplements along with the vaccine, Dr. Thompson said. The GPEI website includes estimates from one of Dr. Thompson’s studies that put these additional benefits at $17 billion to $90 billion. Education of medical students is another critical factor that shapes disease management, Dr. Thompson said. Today’s future doctors, who did not grow up during the polio epidemics, must be trained to promote the benefits of vaccination and to recognize disease’s symptoms, she said. Vaccines have wiped out the disease in all but three countries, with the last case of polio reported in the Western Hemisphere in 1991. However, until complete eradication occurs, the threat of the virus remains. “We’re making lots of progress, but it’s still a problem,” Dr. Thompson said. Once wild polioviruses are eradicated globally, OPV will no longer be an option, because of the risks of vaccine-associated paralytic polio and vaccine-derived polioviruses, Dr. Thompson said. However, global adoption of IPV for post-eradication use depends on making IPV more affordable. “Science and technology enable us to implement new strategies and to see the benefits of prevention,” said Dr. Thompson, adding that represents an important tool for health care providers as they seek to manage costs while providing the best care for patients.